CHASING FOOD DREAMS: Zuan Yuan, One World Hotel: Mooncake Resonance with a Dim Sum Feast! Zuan Yuan, One World Hotel: Mooncake Resonance with a Dim Sum Feast! 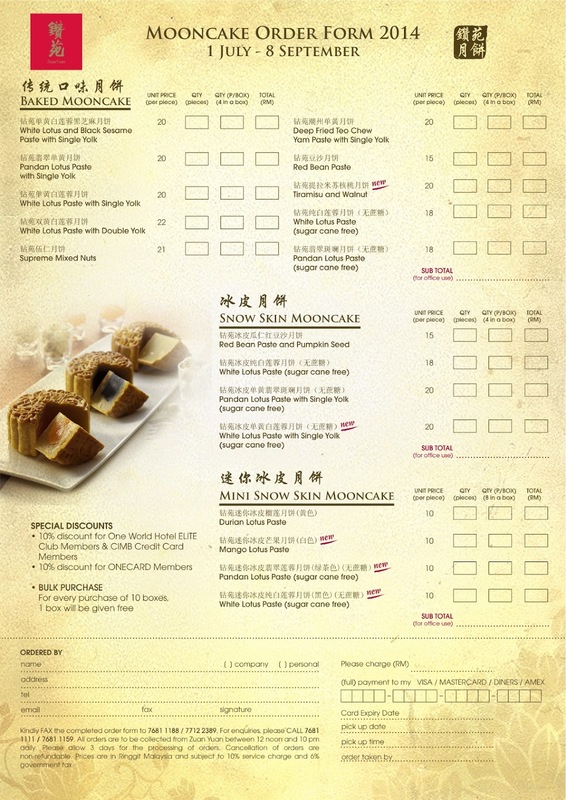 Mooncakes and Dim Sum are the Perfect Combination to Usher in Mid-Autumn Festival! As we are just less than two weeks away from the 15th day of the eighth lunar month where Mid-Autumn festive celebration is in order, preparations are in order for many plan their reunion with family and friends. During this festive season, it is also customary that many presents the delectable mooncakes to their loved ones and friends. Zuan Yuan at One World Hotel had an early start this year, presenting 18 scrumptious mooncakes in traditional and modern flavours handcrafted by Master Chef Chan Choo Kean and Dim Sum Chef Jordan Chin together with the kitchen team. Savor the Baked Mooncake series with 10 flavours, Snow Skin Mooncake series with 4 flavours and Mini Snow Skin Mooncake series with 4 flavours. There are five new flavours this year making its debut in the list. Leading the pack is Mini Snow Skin Mango Lotus Paste, Mini Snow Skin Pandan Lotus Paste (sugar cane free), Mini Snow Skin White Lotus Paste (sugar cane free), Snow Skin White Lotus Paste with Single Yolk (sugar cane free) and Baked Tiramisu and Walnut. This year, Zuan Yuan’s mooncake gift box takes on opulence with its yellow and gold theme laced with shades of purple. The mooncake gift boxes come in four or eight piece set. The Baked Mooncake series consisted of White Lotus and Black Sesame Paste with Single Yolk, Pandan Lotus Paste with Single Yolk, White Lotus Paste with Single Yolk, White Lotus Paste with Double Yolk, Supreme Mixed Nuts, Deep Fried Teo Chew Yam Paste with Single Yolk, Red Bean Paste, Tiramisu and Walnut, White Lotus Paste (sugar cane free) and Pandan Lotus Paste (sugar cane free). The new Tiramisu and Walnut has a deep robust coffee essence and is perfect for those who love the flavours and aroma of coffee. I enjoyed the White Lotus and Black Sesame Paste with Single Yolk and the Deep Fried Teo Chew Yam Paste with Single Yolk tremendously. The black sesame paste is fragrant ad gives a nutty edge to the lotus while the flaky layers of the Teo Chew coupled with creamy mashed yam and salty nuances of duck egg is a blissful mix of heavenly flavours. Each Teo Chew Yam Paste with Single Yolk mooncake is deep fried to order. The Snow Skin Mooncake series has Red Bean Paste with Pumpkin Seed, White Lotus Paste (sugar cane free), Pandan Lotus Paste with Single Yolk (sugar cane free) and White Lotus with Single Yolk (sugar cane free). Since a lot of people these days are more health conscious, the sugar cane free mooncakes are perfect as the chef uses glucose as a replacement. The Mini Snow Skin Mooncake series is adorable in size and offers Durian Lotus Paste, Mango Lotus Paste, Pandan Lotus Paste (sugar cane free) and White Lotus Paste (sugar cane free). Chef Chin has managed to create a crystal skin recipe for the snow skin mooncakes using special flour that retain its fine chewy and soft crystal skin even when it is refrigerated. The skin will not dry out easily as well, making the snow skin mooncakes very enjoyable at chilled temperature. The Mini Snow Skin Durian Lotus Paste remains a popular favourite as D24 durian is used. I prefer the Mini Snow Skin Mango Lotus Paste where the fruity mango flavours is gorgeously flavourful and aromatic in each bite. Available from 1 July to 8 September, 2014, Zuan Yuan mooncakes are available in beautiful gift boxes of four or eight pieces. For orders or enquiries, please call Zuan Yuan at 603 7681 1159. 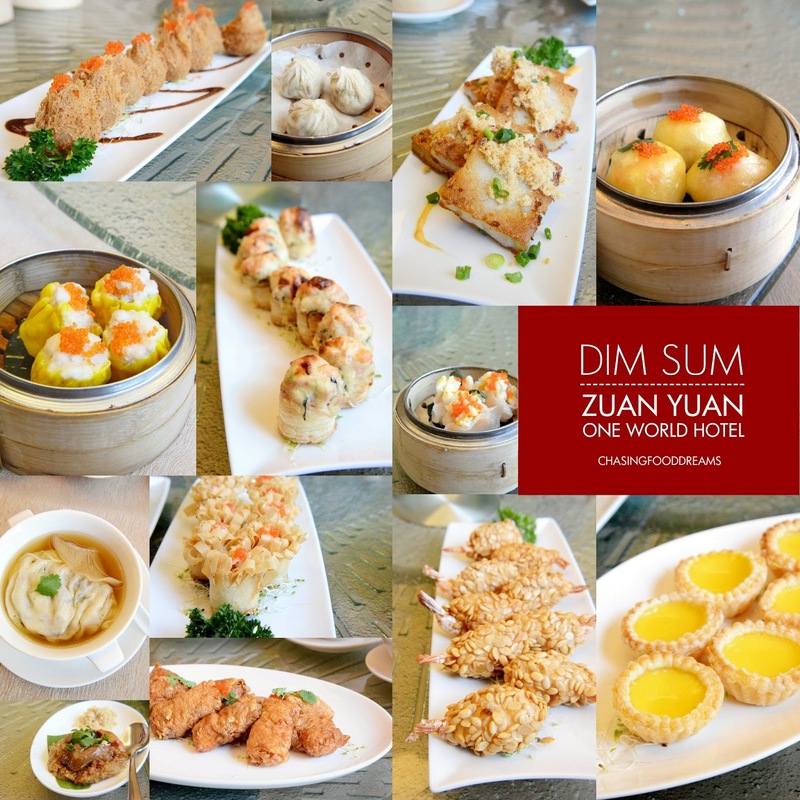 Besides our Mooncake Resonance, Zuan Yuan offers scrumptious dim sum for lunch every day. The dim sums are pretty at sight and utterly delicious in flavours. We started with Steamed Seafood Dumpling with Superior Soup and Shark’s Fin, a giant dumpling stuffed with lots of oceanic treasures and mushrooms soaked in superior broth. It’s hearty and warming to always kick of any meal with a good broth! Steamed plump dumplings are next, with many passing with flying colors in flavours, textures and presentation. We had Steamed Saffron Dumpling with Scallop, Cod Fish Dumpling with Orange Skin & Pumpkin, Steamed Siew Mai with Flying Fish Roe Zuan Yuan Style and Steamed Shanghai Chicken Siew Long Pau. Each one renders their own flavours depending on the ingredients and these are plump and juicy with bouncy prawns and chicken meat. My favourite of the lot has to be Saffron Dumpling with Scallop and Steamed Siew Mai with Flying Fish Roe Zuan Yuan Style. There is also the Steamed Glutinous Rice with Chicken Wing and Mushroom. Fried dim sum showcase Crispy Spring Roll with Prawn Paste, Oven Baked Salmon Tart with Chinese Spinach & Cheese, Taro Dumpling Wu Kok Style with Scallop and Black Pepper Sauce, Deep Fried Crispy Prawn and Squid Dumpling coated with Pumpkin Seed, Deep Fried Prawn Roll with Goose Liver, Pan Fried Turnip Cake with Dried Shrimp, Stir Fried Turnip Cake and Oven Baked Egg Tart. High recommendation goes to the Deep Fried Prawn Roll with Goose Liver, Pan Fried Turnip Cake with Dried Shrimp and Oven Baked Egg Tart. What a dim sum feast! For enquiries or reservations, please call Zuan Yuan at 603 7681 1159.